The first time that I had to differentiate my Christian faith as either Protestant or Catholic was while I was serving in the military. While filling out my personnel file on the computer, I came to the question about my religious faith. I typed Christian in the space provided, however that triggered the choice of either Protestant or Catholic. That was the first time in my life that I had to choose a Christian affiliation. My supervisor explained to me that I was a Protestant since I did not identify as a Catholic whom she said were Christians too. While stationed in Utah, I would engage in conversations with Mormons who would attempt to assure me that they were Christians too. When I would begin to discuss the Bible, they would refer to the Book of Mormons. The Catholic Church also uses other teachings besides the Bible. In fact, the Catholic Church added the following books to the Bible: books of Tobit, Judith, Wisdom, Ecclesiasticus (Sirach), Baruch, 1 and 2 Maccabees, as well as some additional stories and verses in the books of Daniel and Esther. Catholics refer to these seven books as the deuterocanonical” books, meaning the “second” standard books. The Mormons use the Book of Mormons as an additional book that goes along with the Bible (another testament). The problem with these books is that they contradict the 66 books of the Bible that Protestants use as the sole source for God’s divinely inspired word. My question to these religious organizations who claim to be a form of the Christian faith is how come each one of you feel the need to write (use), add another or additional books to (as they claim) go along with or is an extension of the Bible? I believe that there are two answers to this question. First, The Bible removes man from power and proclaims that God is all-powerful (omnipotent). Man has always desired to judge and control other men regardless of his own weak and sinful nature. These additional books (written and inspired by men) places a man (a Priest, Joseph Smith) in the position of power to confer blessing or to require one to confess his or her sins to them. These church leaders are taking on the role of Jesus the Christ (although no one will admit it). The Bible levels the playing field by stating that all have sinned therefore rendering every human not worthy of judging another. Secondly, man’s sinful pride desires to earn his or her own salvation. In other words, man would rather go to God and say that he or she is good enough to enter heaven because he or she earned it by his or her own merit (through good works). The Bible forces men to humble themselves with the knowledge that there is nothing he or she can do to earn eternal salvation except to accept the gift of salvation through faith in His son Jesus. The imputed and imparted righteousness of CHRIST are both offered at the same time to those who accept GOD’S offer and provision of salvation. Since all have sinned and are falling short of the honor and glory [b]which God bestows and receives. All religions are aware that the Bible is considered the only book that is believed to be the divinely inspired word of God. Therefore other religions that claim to be another form of Christianity will use a few scriptures from the Bible out of context because they know that most people (including professed Christians) know little about the Bible and are not equipped to spot misquotes. It is a damning indictment that supposedly Bible believing Christians can be so easily stumped (by biblical misquotes) by religions that claim to be another form of Christianity. In fact, most religions often start talking about the Bible in the beginning. They know that if they were to admit from the beginning that they do not rely on the Bible as the sole source for the word of God that people would not listen to their teachings. Misquoting God’s words as a means to deceive is not new; it began in the Garden of Eden with the serpent and Eve. Eve; however at least had an excuse because she did not have the written word readily available (as we do) to compare the words that Satan attributed to God to God’s actual words. My interest in learning the fundamental doctrines that separates Protestants and Catholics peaked during my recent Christmas vacation to Rome, Italy. The tour group that I was part of was present at St. Peter’s square on Christmas day and witnessed Pope Francis’ Christmas message. Since the Pope delivered his message in Latin, the tour guide translated it in English after the service ended. The tour guide said that at the end of his message, the Pope forgave our indulgence and we were then free to continue to indulge (in his case, excessive wine consumption). I immediately told him that Jesus had already forgiven our sins when He died on the cross and that no man has the power to forgive sin. Furthermore, Jesus would never tell someone that he or she was free to continue in sin. In fact, after Jesus healed someone he would warn him or her to sin no more. God does not command us not to sin because He does not want us to have fun. Sin destroys the body and the soul. Afterward, when Jesus found him in the temple, He said to him, See, you are well! Stop sinning or something worse may happen to you. The man went away and told the Jews that it was Jesus Who had made him well. The day after Christmas, we toured St. Peter’s Church. During the tour, I was struck by how Jesus was portrayed in statues and paintings. Jesus was always portrayed as weak and powerless whereas, the Catholic Priests and Mary (the mother of Jesus) were portrayed as strong and powerful. Jesus was either portrayed as a baby, suffering on the cross or lying dead in Mary’s (His mother’s) arms. Jesus is not some weak dead savior. He rose from the dead with all power in His hand. He ascended to heaven, and is seated at the right hand of God the Father. Jesus is in heaven interceding on our behalf. The tour guide that took us through St. Peter’s Church informed us that the Pope blessed the baby Jesus before it was placed in the manager at the large Nativity Scene display in St. Peter’s square. There are two problems with the Pope’s blessing the baby Jesus. First, there is no baby Jesus to bless. Jesus died and rose again at the age of 33. Secondly, sinful man cannot confer blessing over a holy God. Jesus was Lord at birth and Lord when He died and rose from the dead. Three fundamental doctrines separate Protestants and Catholics. The Protestant relies solely on the word of God for instructions, and goes to the throne of grace in his or her devotion; while the Roman Catholic consults the teachings of his or her church, and offer prayers through the mediums of the Virgin Mary and Saints (dead humans). Mary, the mother of Jesus is elevated to a position of power in the Catholic Church that contradicts how she is portrayed in Biblical teachings. The Bible never says that Mary was anyone but an ordinary human whom God chose to use in an extraordinary way. Catholics take the term “highly favored” in Luke 1:28 out of context. The phrase “highly favored” comes from a single Greek word, which essentially means “much grace.” Mary received God’s grace. Grace is “unmerited favor,” meaning something we receive despite the fact that we do not deserve it. Mary needed grace from God just as the rest of us do. In Catholic teachings, salvation is dispensed by the church, especially through the sacramental system. The church has the authority to grant partial or plenary (full) remission of the temporal punishment of sin by selling memorial masses and indulgences. These can alleviate, shorten, and even eliminate the time spent in the purging fires of purgatory. “If any one shall say that justifying faith is nothing else than confidence in the divine mercy pardoning sins for Christ’s sake, or that it is that confidence alone by which we are justified… let him be accursed,” (Canon 12, Council of Trent). “If any one saith, that man is truly absolved from his sins and justified, because he assuredly believed himself absolved and justified; or, that no one is truly justified but he who believes himself justified; and that, by this faith alone, absolution and justification are effected; let him be anathema,” (Canon 14, Council of Trent). No one can MERIT the initial grace which is at the origin of conversion. Moved by the Holy Spirit, we can MERIT for ourselves and for others all the graces needed to attain eternal life, as well as necessary temporal goods,” (Catechism of the Catholic Church 2027). By contrast, the Bible teaches salvation is a divine gift of grace, not a human achievement. Jesus died to pay the penalty for all of our sins. We cannot earn justification or merit justification in any way. If we could, there would have been no need for Jesus to go to the cross. Therefore, since we are now justified ([f]acquitted, made righteous, and brought into right relationship with God) by Christ’s blood, how much more [certain is it that] we shall be saved by Him from the indignation and wrath of God. Which are we to believe? The Roman Catholic Church or God’s word? Any Bible believing Christian should be able to discern that we are living in the last days. We are witnessing what is prophesied in the Bible (2 Timothy 3) every day. Millions of souls are being deceived and led astray by false doctrines and false prophets. We who have been saved are mandated by God to teach the unadulterated whole counsel of God to a dying world. If we do not reach the world, who will? ← What Do Gays Really Want From The Church? As you requested I responded to each and every assertion you made about the Catholic Church that is not true. Here is my response. First Assertion: “In fact, the Catholic Church added the following books to the Bible……….. “ and you list the 7 books. No they did not. Those books were part of what was known as the Septuagint and it was the version of the Old Testament used by Jesus and the disciples. The church adopted that version of the Old Testament since there was not an official one. Martin Luther went with the version that omitted those books because they contained passages that did not adhere to his beliefs. Here is a history of how the canon of the Old and New Testaments came about. You can find this from many sources but the source I am using is http://www.beginningcatholic.com/books-of-the-catholic-bible.html . As a critical thinker you will want to confirm the validity of this history by comparing it with other sources since the word “catholic” is in there. Second Assertion: “Those books contradict the other 66 books of the Bible that protestants use” . Not some Bibles that protestants use. Perhaps the King James Version because it is the remnants of the Bible that was left in tact after Martin Luther took out the books he did not like that had passages in them that clashed with his beliefs. He also did not like the Pentateuch, which is the first 5 books of the Old Testament. He thought James was worthless and wanted it removed as he did Hebrews and many other books. Here is a complete list of those he played with or removed: Genesis, Exodus, Leviticus, Numbers, Deuteronomy, Esther, Job, Ecclesiastes, Jonah, Matthew, Luke, John, Acts, Romans, Hebrews, James, Jude, and Revelation. Now we can move on down a few pages ( perhaps 3 or 4 paragraphs) since the conclusions and discussions you write immediately after your 2nd assertion rely upon assertions 1 and 2 being true; and they are not. Let’s pick up again with your trip to Italy. 3d Assertion: The pope forgave sins and then freed everyone up to go out and do whatever they want.. in the case of your tour guide, drink excessively. Section 1441 of the church teachings states emphatically that ONLY GOD FORGIVES SINS. Jesus said of himself “The Son of man has authority on earth to forgive sins”. Further, by virtue of his divine authority he gave that power to men to exercise in His name. (Luke 20: 21-23) . As you can see, the examination of conscience goes completely through the 10 commandments and challenges the Christian to think of their lives with those commandments from God in mind. Jesus said he did not come to destroy the law, he came to fulfill it, so the 10 Commandments are important. I go through this type of examination of conscience when I go to confession for reconciliation with my church and asking God for forgiveness. ( James 5:16 says confess your sins one to another ). 4th Assertion : Jesus being portrayed as weak and powerless in paintings and statues. I am taken aback by this and find this totally a creation of your own imagination. These paintings you are seeing are artistic renderings and I am quite sure that if you leaf through your own Bible you will see similar paintings. Those are paintings by DiVinci and others. 5th Assertion: The pope blessed the Baby Jesus before putting it in the manger. I’m afraid you read way too much into that. Any blessing the pope made regarding the manger, the manger scene or anything else would have been him asking God’s blessings on it so that it would lead to someone finding their way to Christ. That was no different than you or anyone asking God to bless your new house, your new car, your new church, your new Bible, etc. The church has many sacramentals ( things that remind us of the sacraments the Jesus established) . There is nothing magic about them, they are just like pictures in a Bible or the Protestant cross or the Catholic crucifix. They are reminders; just like pictures. Your analysis of that is frankly far-fetched. 6th Assertion: Consulting Teachings of the Church, Prayers through the Saints, Mary having power in the church. What is wrong about consulting the teachings of the church? There is over 1,500 years of study by some pretty smart people … the same ones that decided on the canon of the New Testament that you say you follow verbatim that have interpreted the scriptures and through the traditions of the apostles developed the church teachings. The catholic church was the only church until about 1570. The Methodist church pretty much looked exactly like the Catholic church in its liturgy and regarding the sacraments until the 1930’s. The teachings of the church are the basic teachings of every mainline protestant church with the exception of the real presence of Christ in the Holy Eucharist and perhaps purgatory. I think it is kind of nice for me to have this 1000 page book that I can look up things, read about how the church fathers thought about them and then trace them back into the Holy Scriptures. I repeat, what is wrong about that? Sorry that was so long but you hit on a lot of subjects. You asked, “ Which are we to believe? The Roman Catholic Church or God’s word? Well, the Catechism ( our book on church teachings) is broken up into several sections. The first is “The Profession of Faith” which is the Nicene Creed and it takes each part of that and ties church teachings to the creed and to scripture. Here is a link to the Catechism of the Catholic Church. http://www.usccb.org/beliefs-and-teachings/what-we-believe/catechism/catechism-of-the-catholic-church/ I would think that you should have full knowledge of something you are going to criticize so harshly. First Assertion: “In fact, the Catholic Church added the following books to the Bible……….. “ and you list the 7 books”. The Jewish canon, or the Hebrew Bible, was universally received, while the Apocrypha added to the Greek version of the Septuagint were only in a general way accounted as books suitable for church reading. Apocrypha means writings or statements of doubtful authenticity (pseudonymous) writings. Pope Damasus (366-384) authorized St.Jerome to translate the Latin Vulgate. St.Jerome was the first to describe the extra 7 Old Testament books as the “Apocrypha” (doubtful authenticity). St. Jerome’s Latin Vulgate did not include the Apocrypha. St.Jerome vigorously resisted including the Apocrypha in his Latin Vulgate Version (400 AD), but was overruled. The Roman Catholic Church did not officially canonize the Apocrypha until the Council of Trent (1546 AD). This was in part because the Apocrypha contained material which supported certain Catholic doctrines, such as purgatory, praying for the dead, and the treasury of merit. These books were not allowed a place among the sacred books during the first four centuries of the Christian Church. Not one of them is in the Hebrew language, which was alone used by the inspired historians and poets of the Old Testament. These books were never acknowledged as sacred Scriptures by the Jewish Church, and therefore were never sanctioned by our Lord. More importantly, these additional books are full of statements which contradict the canonical Scriptures. For the Word that God speaks is alive and full of power [making it active, operative, energizing, and effective]; it is sharper than any two-edged sword, penetrating to the dividing line of the [g]breath of life (soul) and [the immortal] spirit, and of joints and marrow [of the deepest parts of our nature], exposing and sifting and analyzing and judging the very thoughts and purposes of the heart. The tour guide was a knowledgeable man and a practicing Catholic (probably in his mid-50s). You quote what your church (The Catholic Church) teaches according to the doctrine of man (book of Catechism and so forth). I do not have any interest in learning or hearing about any teachings unless it comes from the word of God, the Bible. Church doctrine is false doctrine unless it comes solely from the Bible. Jesus was still speaking to the people when behold, His mother and brothers stood outside, seeking to speak to Him. [u]Someone said to Him, Listen! Your mother and Your brothers are standing outside, seeking to speak to You. But He replied to the man who told Him, Who is My mother, and who are My brothers? And stretching out His hand toward [not only the twelve disciples but all] [v]His adherents, He said, Here are My mother and My brothers. For whoever does the will of My Father in heaven is My brother and sister and mother! Secondly, it is important for sinners to know and see Jesus as the resurrected savior not a savior that is still on the cross suffering (although we all need to remember that He suffered and died to pay the price for our sins). The Christian faith is Jesus being raised from the dead (defeating death, hell and the grave) with all power in His hand, breaking the power of sin, sickness and death over our lives. Every Catholic Church that I have seen (I have seen many) has Jesus still on the cross. Jesus is not still on the cross! 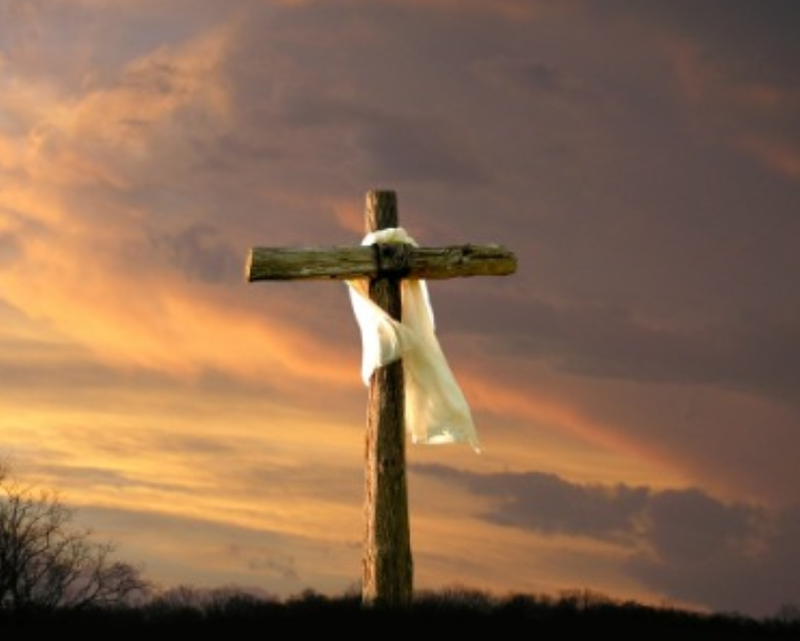 The bare cross and the empty tomb is a symbol of VICTORY. Jesus approached and, [a]breaking the silence, said to them, All authority (all power of rule) in heaven and on earth has been given to Me. And [as to His divine nature] according to the Spirit of holiness was openly [a]designated the Son of God in power [in a striking, triumphant and miraculous manner] by His resurrection from the dead, even Jesus Christ our Lord (the Messiah, the Anointed One). How do you know what the Pope was thinking when he blessed the baby Jesus doll? How do you know what he was asking God? If any Christian wants a sinner to “find their way to Christ” he or she should witness to the individual by teaching them the word of God and living a godly life before them so that the sinner will see Jesus Christ alive in our lives. All I see is the Pope following a tradition which has no bearing on the present (Jesus Christ sitting at the right hand of God the Father). All church teachings should align with Biblical scripture! If a so-called church teachings contradicts the Bible, it is a false church teaching false doctrines regardless to how smart the people are who wrote the history. First, saying (hoping) that one’s mother or loved one is in heaven is one thing but to claim that that individual is watching over you is a loving wishful thought. Dead people have no power or influence on the living. Secondly, unless that individual repented of his or her sins and accepted Jesus Christ as their Lord and Savior, that individual is not in heaven, the Bible tells us that they are in hell. I noticed that you said “went directly to heaven”. The Bible teaches us that when a person dies, they go to either heaven or hell. There is no holding place in between. In addition, once a person has died, there is nothing anyone alive can do for that person’s soul. That is why it is so important for sinners to accept Jesus Christ while they are still alive. In your response, you still did not address the contradiction that I outlined in the article between the Bible and the Catholic Church’s teachings on the forgiveness of sin, salvation and justification. The RCC is Satan's masterpiece of deception. While I share your opinion that both Catholics and Mormons have some strange ideas that come from dubious sources, they aren’t alone. I was raised in the Baptist church and come from a devout family. It was really an eye opening moment when I realized what was going on in the story of Jesus’s first miracle. As you well know, Baptists frown on drinking, but here Jesus is providing the wine. I was always told some convoluted thing about how “wine” in the Bible was not fermented, but that is clearly not the case. I’m not picking on Baptists, or Protestants generally, just pointing out that every denomination has its own institutionalized errors, not just the Catholics and Mormons. I personally have no doubt that both of those groups are Christians. I lived next door to some Mormon missionaries for a while, and got to know a little about them and their church. They never convinced me of their doctrine, but if you are to know a tree by it’s fruit – I have no doubt as to their conviction to Jesus Christ.